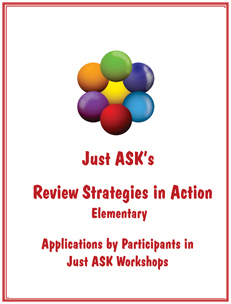 The Just ASK Mentoring Memo features Tools of the Month and mentoring calendars for the current month; these monthly calendars, excerpted and updated from The 21stCentury Mentor’s Handbook, offer suggestions for mentoring actions to support novice teachers and teachers new to the district in eight areas of concern: Personal; Professional; Curriculum, Instruction, and Assessment; Organizational Systems; Students, Colleagues; School and School System; Parents and Community. When you check out these calendars, you will quickly see how useful it can be in your work with new teachers whether you are an administrator, mentor, instructional coach, or colleague. We are offering you access to one of our favorite tools for working with new teachers. Not only are we providing you a PDF copy of our Top Ten Tips for Teaching and Learning in the 21st Century (cross referenced to Why Didn’t I Learn This in College? ), we are also providing you a 30 slide PowerPoint Show to use in elaborating on those tips in either individual or group settings. Just ASK consultants use this handout and these slides across the country in our work with both new and veteran teachers. To use these tools in a group setting, have the new teachers bring their copies of Why Didn’t I Learn This in College? with them to the meeting, provide each attendee with a copy of the Top Ten Tips, and use the companion PowerPoint Show. Have them create visual representations, jigsaw the questions, create three-column charts, or any other active engagement strategy you want to model. You have in your hands an instant winner! Access the Top Ten Tips and the Top Ten Tips PowerPoint Show by clicking on the graphics below. Access these tools in one of two ways. Don’t miss the opportunity to check out this slide collection. For more information, if you can access a copy of Creating a Culture for Learning: Your Guide to PLCs and More, you will find that pages 56-68 provide powerful information about what we at Just ASK call The Three Cs which include coaching (with reflective questioning), collaborating, and consulting. 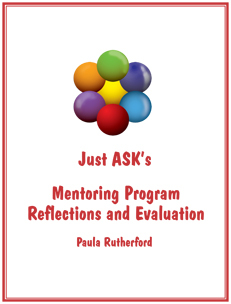 Access the 17 archived issues of Mentoring in the 21st Century® and use them in multiple ways to support your mentoring work. This e-newsletter written by Paula Rutherford, Just ASK Senior Consultant, is copyright free; we encourage you to reproduce it to share with novice teachers and mentoring colleagues as you wish. Just ASK consultants frequently use them in onsite workshops and institutes. This e-newsletter is no longer published so only archived issues are available. Each month during the school year we post the mentoring calendar for the current month. This month we are featuring our Opening of School Checklist that provides in great detail far more suggestions that you can ever implement. As you read through this checklist, note those that seem well matched to your protégée(s) needs and implement them. If you are not the person who is interacting directly with novice teachers and teachers new to the district, be sure to send this checklist to those who are. To ensure that the right people have this valuable list, post it or link to it on your district/school website. And, since the developer has a special education background, there is also an Especially for Special Educators section. In this Just ASK video, there are inspirational and funny quotes for new teachers. Enjoy it yourself and then share it with colleagues. In this Just ASK video, new teachers who have just finished their first year of teaching provide an inspiring collection of comments culled from hundreds we’ve collected. It is designed to celebrate all that you do to support these new teachers. Enjoy it yourself and then share it with colleagues. This amazing new clip was released in November and the response has been phenomenal! We are including it again this month so that we can be sure that you did not miss it. It, too, would make a great gift for your protégées! It is a 13 minute video clip that is a component of one of the DVDs in Just ASK’s TL21 DVD Collection. In this segment, Shari VanderVelde, 4th/5th grade teacher at Orchard Avenue School, Grand Junction, Colorado, is interviewed by Just ASK Senior Consultant Brenda Kaylor. Shari provides thoughtful and provocative responses to Brenda’s reflective questions. Brief classroom episodes add visual reinforcement for Shari’s comments. How do you coach beginning teachers in terms of the world of planning? What is the secret to success with formative assessment? What about the classroom environment, the structure of what is on the walls, how you arrange tables, chairs, desks, and bean bags. That is, how do you set up the room as a learning place? In a learner-centered classroom, what is the role of the student? Everything I’m doing in my classroom all day long leads to formative assessment. If I’m asking kids a question during a focus lesson and I’m listening for their answers, that’s a formative assessment because it provides me with information about what they know or what they don’t know. I can’t tell you how many times I’ve been disappointed in the quality of talk. But that just means that I need to backup and do a better job of teaching how to engage in good talk. The environment is crucial. I’m spending all day there so I would like it to be comfortable and welcoming and the kids are spending all day in there with me so I’d like it to be comforting and welcoming for them as well. work in pairs and discuss the questions and write their own ideas about possible answers to each of the interview questions before they view or read the questions. (If working with just one person, provide a list of the questions in advance so that he can consider possible responses to each question and be prepared to discuss them with you. complete “aha” and “?” cards to submit as “tickets to leave.” You can then use the “?’ cards to start your next session or discussion. This Just ASK clip features a school principal, an induction coach, and a novice teacher from St. Vrain Valley School District, Longmont, Colorado. You will hear them discuss how they work as a team to ensure not only high levels of student learning, but purposeful professional learning for the new teacher. Always a tricky relationship, it is helpful to hear from not only the principal and the coach, but also from the novice teacher, about the importance of trust and confidentiality. Enjoy these Mentoring Words of Wisdom and share this clip with your colleagues. This Just ASK clip features three sets of novice teaches and their coaches explaining how their year-long collaboration has made each of their professional lives richer. The first interview features a high school English team, the second a middle school science team, and the last, a second grade team. These Mentoring Words of Wisdom from induction coaches about how they make their coaching decisions and the novice teachers’ words of appreciation for that coaching work and the impact it has made on their professional practice are cause for celebration. Enjoy this clip and share it with colleagues. These professionals from St. Vrain Valley School District in Longmont, Colorado, clearly communicate the power of high quality support for novice teachers. These volumes build on Volumes I, II, and III which are available only in our resource kits for mentors and new teachers. They are the perfect “sussie” (aka unexpected surprise) to send protégées, mentors, other colleagues, or friends in celebration of birthdays or holidays or to make an ordinary day special. They are also great as closings to meetings or workshops. These collections of inspirational and often humorous pearls of wisdom from men and women through the ages and set to enchanting music were selected to promote smiles, nods, and reflection.